PYEONGCHANG/MOSCOW—Russian Olympic curler Alexander Krushelnitsky has been found guilty of an anti-doping violation after testing positive for the banned substance meldonium, the Court of Arbitration for Sport (CAS) said on Thursday. CAS said the Olympic Athletes from Russia (OAR) mixed doubles curling team, who won bronze at the Winter Games in Pyeongchang, had been disqualified from the competition over the violation. 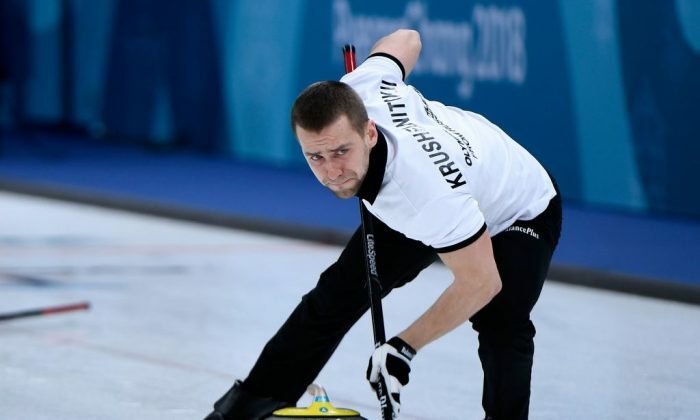 Krushelnitsky, who won the medal with his wife, had accepted a provisional suspension beyond the period of the Games, CAS said, adding that the athlete had “reserved his rights to seek the elimination or reduction of any period of ineligibility” following the Games. The announcement came hours after CAS canceled the hearing into the case at the request of the International Olympic Committee, the World Curling Federation and Krushelnitsky himself. Dmitry Svishchev, president of Russia’s curling federation, said he hoped giving up the medal was a temporary measure. The doping case has come at a delicate time for Russia, which has been accused of running a state-backed, systematic doping program for years, an allegation Moscow denies. Russians are competing at Pyeongchang as neutral athletes, and Russia had been hoping that a clean record at the Games would enable it to return to full Olympic status. Krushelnitsky and his wife Anastasia Bryzgalova have agreed to surrender their medals, according to the Russian curling federation. Russian Sports Minister Pavel Kolobkov said on Wednesday he hoped the Pyeongchang doping case would not impact the IOC’s deliberations on whether to let Russia regain full Olympic status. The IOC has said it might allow the Russians to march with the country’s flag and in national uniform at the closing ceremony of the Games on Sunday, provided they have complied with its code of conduct on neutrality. The Russian Olympic delegation has said it could not explain how meldonium had ended up in Krushelnitsky’s body and pledged to investigate.